Hello Visiteur, hi everybody ! New stuff is a brand new website, totally re-designed with my friend Marc Poveda's great help (Marc is the fellow who produced my two last alst albums Thankful and Love & Light). It took me a long time to achieve this, so please be my guest... and don't forget the guest book ! Old stuff is my debut album Bootstompin' the Blues. Originally released back in 1998, it's now available, like the two others, on all music platforms, thanks to la Fissure Prod Label. My discography is now complete by legal digital downloading. 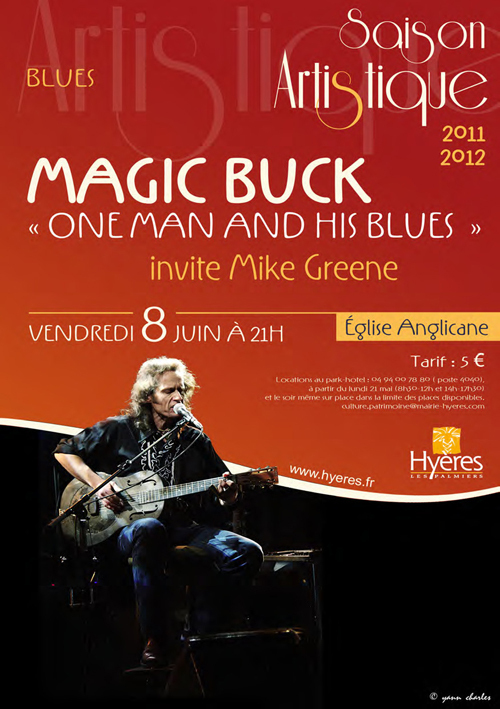 And coming soon, back to live performance in my home country with the concert at Anglican Church in Hyères on friday 8th, with my friend Mike Greene, who was one of the three guests on my last album Love & Light, and the only one Marc Poveda as sound engineer. If you're part of the lucky guys who stop by the french riviera in june, check the web site for details... What ? You already started to visit ?